Strawberries and champagne – two Wimbledon must-haves that are the perfect accompaniment for an afternoon of tennis and sun. Luckily, our lovely friend, Amanda, from The Ana Mum Diary is here to share her perfectly simple yet delicious champagne cocktail recipe that only consists of three ingredients. Where do we sign up? Firstly, take your punnet of strawberries and pull off the green stems and leaves, then add to a blender with two mint leaves for a fresh kick and blitz these up until they make a puree. If you have a particularly sweet tooth or your strawberries aren’t in season, feel free to add a little sugar syrup, but if the strawberries are ripe (which they should be in July), your puree should be sweet enough from the natural sugars in the fruit. Next, add a three teaspoons of your puree into a champagne flute, and top off with ice cold champagne. Et voila, the perfect summer cocktail to accompany an afternoon of spectatorship. First up, is this impressive- looking tennis racket garland that may look complicated, but is actually rather easy to master. To start, take your cardboard and cut the outline of a tennis racket shape out of the cardboard, ensuring to cut a hole in the middle for your racket wire. This should be cut to the size that you want your rackets, but we would recommend 10cm x 5cm. Next, take your cardboard template and use this to cut out racket shapes in the felt until you have 15 or so rackets to hang on your garland. Then, cut small strands of yarn to fit inside your rackets. About 4 pieces of yarn per racket should make it look detailed enough. Then (carefully) use your glue gun to attach the yarn to your felt in a lattice fashion. Finally, cut a piece of yarn to the desired length of your garland, and use the glue gun to attach your completed rackets to the string. Once fully dried, hang up over your fireplace or attach each end to a tree for the perfect Wimbledon decoration. Now, what would a Wimbledon party be without a celebration of Strawberries? This next garland will ensure that once all your guests have snaffled the strawberries, you’ll still have motifs of the fashionable fruit dotted around your Wimbledon party. Start by cutting a strawberry shape (similar to a heart shape) out of the red felt until you have around 15 strawberries. Next, take the green felt and cut out the foliage to sit on top of the strawberry. Then take your thread and stitch the foliage to the strawberry. Once you have stitched them together, leave around 10cm of thread and stitch the next strawberry together. Not only will the thread attach you two pieces of felt together, but it will also provide the integral structure for your garland. And you’re finished! Not only are both garlands really simple to make, but they provide you and your family with a great afternoon of activities and some fabulous handmade decoration for the sporting party of the year. As you may have already guessed, the team here at Christy HQ can’t get enough of Wimbledon this year, and like a lot of people, we eat, breath and sleep tennis at this time of year. By why should it just stop at the odd Wimbledon-themed party once a year? Why not take some inspiration from the court and bring it into our homes for the ultimate summer upgrade? Luckily, our friend, Jen, from Love Chic Living, is also an avid Wimbledon fan and is here to help discover the ultimate in tennis-inspired home décor. 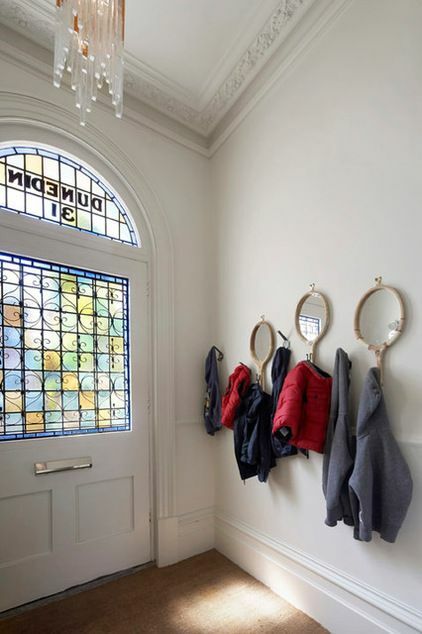 This first idea is a nifty DIY project that will transform a vintage tennis racquet (these can be found online or in most charity shops) into a fabulous multi-purpose addition to your hallway. We think it’s a must for any tennis lover. What would you use yours for? Next up is this beautifully intricate tennis-motif wallpaper from Cazalet Designs. It features a delicate design on a lush green background which makes the piece simultaneously bold yet subtle. It’s fun without being too quirky and wouldn’t jar with other décor pieces. Now, how could we mention tennis-inspired decor without including our beautiful range of Wimbledon textiles? Possibly the easiest way to incorporate the sports-luxe look into your home. Jen’s favourite is the Wimbledon Sports Towel in white. She says: “With just a nod to the tennis scene, this is a bang on-trend way to add some tennis-inspired interiors to your home”. If like us, you can’t get enough of the industrial interiors trend that is everywhere at the moment, this next piece from Etsy will be perfect for you. A fan or the piece, Jen adds: “I just love this piece, it’s so different, stylish and not obvious at all. For the diehard tennis fan, a piece like this is a must. Perfect displayed on its own or as part of a larger wall display, maybe even with the upcycled vintage tennis racquets we mentioned earlier. Also known as The Championships, Wimbledon is arguably the most prestigious tennis event in the world and has been held in the London suburb of Wimbledon since 1877. This year, the two-week event starts on the 3rd July and to ensure that you’re properly prepared, we spoke to William Hanson, the UK’s leading etiquette coach and expert, who gives his advice for those attending Wimbledon for the first time. Follow his advice, and in no time you’ll be sipping on Pimms on the Centre Court in no time. William Hanson says: “Although there are no hard-and-fast rules for spectators (they need not wear all white) “It is generally acknowledged that Wimbledon is an ‘occasion’ and should be treated like such and so smarter dress is worn. If this is your first time at Wimbledon, there’s a few things to note to avoid any potential scowls from fellow attendees. Get the perfect selfie before heading to Wimbledon and we’ll see you court side. It’s that time of year again when it feels like summer, strawberries and cream are back in style and the world, once again, can’t take their eyes off of that little yellow ball. That’s right, Wimbledon is upon us and for that lucky few who get to grace Henman Hill and see the action in person (well, sort of), it’s important to be prepared for the day ahead. A properly stocked bag is the key to enjoying all that the tennis has to offer. With the help of lifestyle and travel blogger, Elle Croft, we’ll share our packing essentials for a day at Wimbledon. Not just practical, a statement pair of sunnies will keep you looking chic among the celebs you’re bound to spot at The Championships. There’s plenty of scrumptious food available on site, but let’s face it, there’s no picnic like a Wimbledon picnic. We’d recommend keeping the menu light and fresh with recipes like this strawberry, avocado and spinach salad, or these turkey, apple and brie sandwiches. Time to be realistic, this is Britain we’re talking about which means a day of grey clouds and constant drizzle isn’t out of the question. While umbrellas aren’t banned from Wimbledon, there is a risk of blocking the view of those behind you or poking your neighbour’s eye out. Instead, we’d recommend taking some quality waterproofs to ensure you stay dry and comfortable, no matter the weather. Elle says: “If you queue for Grounds tickets you’ll need cash just to get in. Once you’re inside you can pay by cash or card to buy your programme, Pimms, and that all-important strawberries and cream”. A picnic blanket, possibly our ultimate essential for a day at Wimbledon, will ensure that you always have a place to sit, whether you’re queuing up, enjoying a picnic or sitting tight on Henman Hill. Top Tip: Our Wimbledon Blanket will make you look like a total pro and can be doubled up as a throw if it gets a little chilly at night. Wimbledon is the perfect Instagram opportunity. The Pimms, the lush green grass and the endless strawberries and cream are made to be documented, so as well as your phone, ensure you take a portable charger to give yourself a well-needed battery boost throughout the day. Whether you’ve got a long day of queuing ahead of you are going for a stroll to discover the outer courts and the stunning flower displays dotted around the walkways, comfortable shoes are a must. We’d recommend avoiding a heel and sticking to tennis shoes, but if you still want a bit of height, opt for a classic wedge. For more Wimbledon tips from Elle, check out her post here.